Gayani provides the complete source code for a sample Data Access Layer for LINQ to SQL, using the Northwind Database, and explains how it all works and how to get good performance. She shows how easy it is to use stored procedure and views as well as queries to provide a robust run-time infrastructure for managing relational data as objects. Almost all current Programming languages model their data in terms of objects while the relational databases use entities and relationships for the same purpose. LINQ to SQL is the first stage of LINQ technology, the aim of which is to bridge the gap between the two different ways of representing data entities. Before the introduction of LINQ, it was a common practice to devise database abstraction layers that translated the information between the relational representation of the database and the application’s domain-specific object models. The aim of LINQ to SQL, which is another component in the ADO.NET family, was to provide a run-time infrastructure for managing relational data as objects without losing the facility of being able to query data, and use stored procedures. It does this by translating language-integrated queries into SQL for execution by the database, and then translating the results back into objects defined by the application domain. The application can manipulate the objects while LINQ to SQL stays in the background, tracking changes to the data automatically. LINQ does not aim to circumvent a data abstraction layer at the database level, based on stored procedures; in fact it makes their use easier for the programmer. When an object is linked to relational data, it receives attributes to identify how properties correspond to columns within the database. This mapping is done by translating the relational database schemas into object definitions, and can be done automatically by design-time tools. LINQ to SQL can be used by any .NET language that has been built to provide Language-Integrated Query. This article discusses how LINQ to SQL can be used to design a data access layer and lists some best practices that can help to improve the performance of the application. When to go for LINQ to SQL? There are several ways to design a data access layer. .NET Framework 3.5 introduced several LINQ providers, including LINQ to SQL. This was intended to provide LINQ over relational databases but was implemented only for SQL Server. .NET 3.5 SP1 added the Entity Framework. This allowed the use of LINQ alongside any database including SQL Server, Oracle, DB2, MySQL, etc. In .NET 4.0, the Entity Framework will be the strategic data access solution for applications that require a conceptual data model with strongly typed data, inheritance and relationships, to a whole range of relational database sources. However, LINQ to SQL will be supported for Rapid Application Development with a SQL Server back end. Layered architectures are generally preferred for applications because of the code reuse, flexibility, performance and maintainability. In a layered architecture, the data access layer is mainly responsible of communicating with the database, whereas the business layer focuses on business logic and business rules. The presentation layer, of course, concentrates on the UI. The following diagram elaborates the structure of the solution in the sample application. There are many ways of manipulating data in LINQ to SQL. There is no restriction in using tables, stored procedures, views or functions. All are possible, and the choice is purely an implementation decision. One way to implement Create, Read, Update, and Delete (CRUD) operations is to configure the behavior on the entity class at design time by specifying the stored procedures, or to use base tables directly, as follows. In this example, a RowVersion column with a timestamp type is added to each table, to identify the row status (modified/not) and to handle concurrency conflicts. C# Code: Perform an insert/update on Product table. First, the rowversion of the product entity is checked to identify whether to insert or update. Then, to insert a new product, the InsertOnSubmit method is called on the Products entity, with the new entity instance passed to it. For updating, the Attach method is called by parsing the entity with changed values, and this sets the modified status to true, indicating that the entity has been modified. The GetChangeSet method call on the data context provides a ChangeSet instance to track down the changes such as insert counts, update counts and delete counts. Finally, the SubmitChanges computes the changes to be made on the database and is executed to implement those changes. Using Stored Procedures (SPs) & Functions to Query Data. When a Stored Procedure or a SQL Function is added to a data context, it is marked as FunctionAttribute and its parameters are marked as ParameterAttributes, this identifies the procedure or Function as a method within the datacontext. LINQ to SQL introduces various ways for handling Stored Procedures with known results; those with return results that change at execution according to parameters passed, and those that return data as output parameters. We can’t hope to cover all the permutations here, so this article will just show how Stored procedures are used with a minimum number of entities within the data layer, by mapping its return type to a particular entity. When a SP is dragged on to a data context in the IDE, it automatically creates its return type which can be identified by the postfix ‘Result’ (ex: Orders_SelectByShippedDateResult). Instead, if we know the return type of the Stored Procedure, we can drag the Stored Procedure on to the entity within the IDE or change the Return Type property of the SP after adding the SP on to data context. It will result as follows. C# Code: Using a SP to query data. C# Code: Using a SQL Function to query data. //GetLastSalesDate is a scaler valued function added to the data context. During an update, each field is checked for concurrency conflicts, this checking frequency is controlled by the Update Check property of each field that can be set to ‘Always‘ or ‘WhenChanged‘. We will use a rowversion of a timestamp column in a table in order to detect concurrency conflicts. Within the data context, the concurrency conflict exceptions are caught as a ChangeConflictException. The ChangeConflicts property of the data context exposes the collection of objects that caused the conflicts while SubmitChanges executes. // expose the neccessary information. The data context is intelligent enough to track the entities that were loaded already, so if a request was made for the same object again, it would not result in two entity instances being loaded but only one. This behaviour of maintaining the uniqueness of the identity of the loaded objects in the data context is called Object Identity. This ensures that in-memory objects are not duplicated. In the above example, load options are used to specify the child entity (Order_Details) that is to be loaded with parent entity (Order) and then the stored procedure (Orders_SelectByShippedDate) is called to filter the Orders. This results in Orders and Order_Details that is filtered by the criteria specified in the SP. Another instance of Order is not required since it is specified in the load options. Once an entity is loaded, the data context will by default, persist its old values and the new values, as indicated by the ObjectTrackingEnabled status being set to true. When retrieving entities with one-to-one, or one-to-many, relationships with other entities, the related entities will also be loaded by default at the time of retrieval. This is indicated by DeferredLoadingEnabled status set to true. The default behavior is not necessarily the best in every circumstance. It could lead to high memory consumption, which will eventually slow the application. It is therefore better to disable the ObjectTrackingEnabled status when retrieving read-only data, and use Lazy Loading instead. The term ‘Lazy Loading’ means that you opt to load the required enitites only. This is done by explicitly defining the entities to load using the DataLoadOptions instance after disabling the DeferredLoadingEnabled status. Note that DeferredLoading requires ObjectTracking. DataLoadOptions used with LoadWith<T> specifes which sub-objects should be loaded with the parent object, and AssociateWith<T>specifies the sub-objects and filter criteria on sub-objects to load when loading with the parent object. In the above example, only the Category entity is loaded at the time of retrieving Products, rather than all the related entities. Apart from these features, data context also ensures that changes about to be committed do not conflict with the changes already made. This is named as an Optimistic offline lock. As well as tracking the changes made since the entities were loaded, it allows changes to be committed in a transactional manner, known as Unit of work. Simple optimization techniques can be used within the application to improve LINQ to SQL performance. Turn off tracking if it is not required. Analyze the SQL Queries executed. Hi nice to see you are very much aware of the new technology and posting it. I was very pleasantly surprised by this article and software. It is a very handy way of coming up to speed with practicalities of a LINQ-based DAL. Forgive me if I missed some detail in your code. Wouldn’t any clients/callers of your business layer need access to the data layer as well in order to pass along or recieve lists of the Product class or Sales class? Since those are created by the LINQ to SQL designer, they are part of your data layer – which should not be exposed to the client software. So, wouldn’t you have to create some sort of Data Transfer Object that mirrors some (if not all) of the Product and/or Sales objects? That DTO would have to reside in a namespace available to all layers of the application. The way you’ve currently designed the code, the data layer’s methods are hidden (they are internal), but the data layer Product and Sales classes need to be exposed to the client. Therefore, the client would need to have a using statment for the Data namespace. The entity instances are used as the data transfering objects and they reside with in ‘Northwind.Product.Data’. The entity classes have the access level of public, for those to be accessed from anyway with in the application. 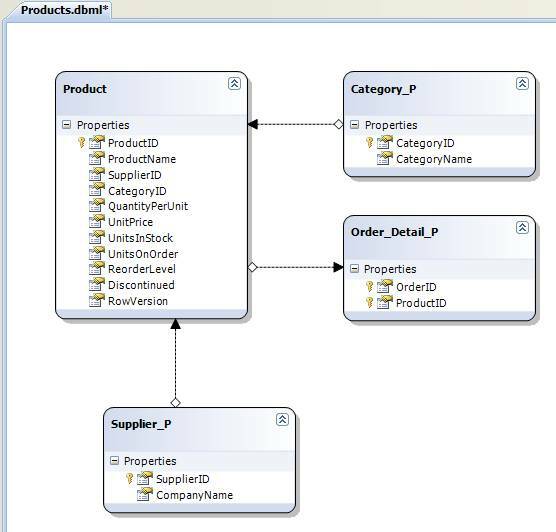 For example, if I query for product information in DAL, using the LINQ to SQL data context, I will be returning an instance of Product class and then from any layer of the application this Product instance data can be manipulated. Right. I understand that. My concern is that the namespace you use for your data layer needs to be used by all clients of your business layer in order to access those transfer objects. In the past, when I have dealt with n-tier application design, I have attempted to keep the data layer either in it’s own DLL or, failing that, made sure that the namespace was separate from the business layer namespace. From there, I typically place the transfer objects in yet another namespace (or DLL) that is shared by all layers. This way, the client only uses the business layer namespace and the transfer object namespace – and never needs to know anything about the data layer namespace or dll. IMHO, LINQ to SQL forces you to create mirrored or similar transfer objects separate of the entities created by the designer if you want to truly have an n-tiered application. It’s something that I’ve been wrestling with over the past few months of using LINQ to SQL in recent projects. @chazmanian: Open up the dbml file so you’re viewing the designer. Take a look at the properties window under the Code Generation section. There are 2 properties, Context Namespace and Entities Namespace, that enable you to separate the entities from the data context. If you want to completely separate the context and entities into two separate dlls, you’ll need to break the generated Products.designer.cs file apart. Check out Plinqo. It’s a set of Code Smith templates that will do just that. Thank you for this article. Is your sample solution missing the LINQtoSQLNorthwind web project? It does not appear to be in the .rar package, unless I’m missing something obvious? Re: Missing project in sample? Hmmm, still not seeing it. Another question though, why did you break up “products” and “sales” into separate assemblies? You noted that you added a “_P” postfix to items in the products assembly to avoid name collisions, but if you just had them all in the same assembly wouldn’t it avoid that? What’s the drawback? The entities you select for an assembly, totally depends on your requirement, ie: the functionality you expect from a particular class library. 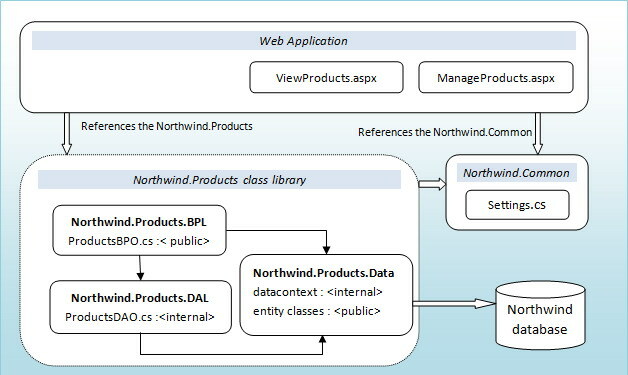 Ex: To expose product related methods I used the ‘Northwind.Products’ while to expose the sales related methods I used the ‘Northwind.Sales’ class libraries. With this I just showed a way to tackle in case you have the same entity in two class libraries. You may come across this kind of a senario when working with real world commercial applications. One important point here is that, I am using individual class libraries for individual units. (Ex: product related methods – ‘Northwind.Products’), by this way I am trying to keep the data context with minimum number of entites and make sure the entities I added are being used. Gaining a clear seperation based on the activity will help you to have more maintainability and to handle change requirements easyly. And, you should get all the web pages and etc in the ‘NorthwindWebsite’ folder in the rar package. Using datacontext.Attach fail in winform? “An attempt has been made to Attach or Add an entity that is not new, perhaps having been loaded from another DataContext. This is not supported”. Your article is great!! I just had a couple of questions. Does ‘Loadwith’ optimize my queries in complex joins where I am selecting different columns from different tables? What should be the return type of my sps in such cases? What is the benefit of DefferedLoadingEnabled = ‘false’ when I am doing an insert or delete or update queries?